8" x 2" wheels in two swivel and two rigid casters. 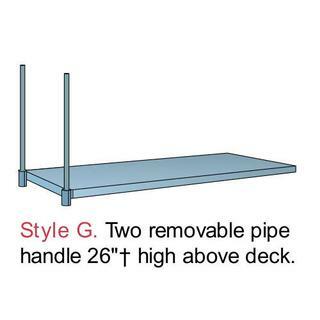 Deck of 1" select hardwood set flush in steel frame. Frame of 2" x 1-1/2" x 3/16" steel angle. Roller bearings and lube fittings in all wheels. Casters bolted to 3/16" steel angle cross bolsters. Removable pipe handle in sockets with set screws. 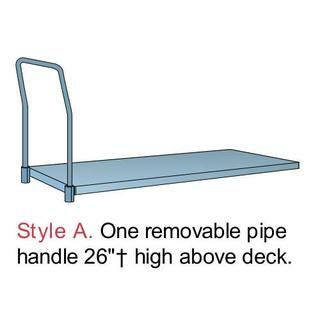 Available with superstructure styles A, G, H, and I. See options below. 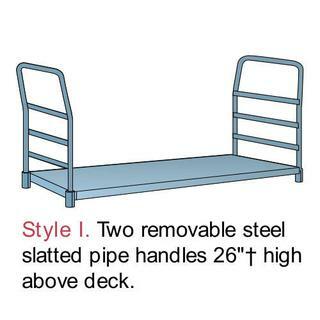 For carrying certain materials, standard flat trucks are often made safer, more convenient and more efficient by changing or adding handles or racks (superstructures). 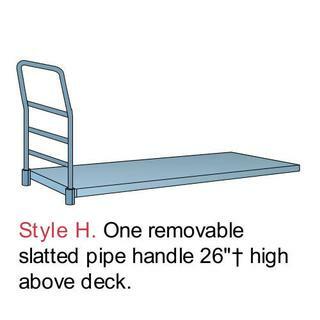 Not every platform truck can be furnished in every style. When adding to superstructure, remember to allow clearance for increases in overall length or width caused by external pipe sockets, offset handles or racks, etc.